ROC the Day is on! Once again we must say goodbye to a valued member of our Rfalconcam community. It’s never easy, and that goes doubly so for Donna. Donna had been following the Rochester falcons for many years and was an active participant in social media going all the way back to the Birdcam days when Mariah and Kaver nested on the Kodak Tower. She was a prolific poster to the Rfalconcam Forum with over 25,000 posts and starting more then 4,000 discussion topics ranging from informative nature stories to custom created birthday cards. In addition, each year during the holiday season she encouraged members to share online greeting cards and collected them in a gallery. Although she resided in New Jersey, she made numerous trips to Rochester to see our falcons and take part in the annual fledge watch much to the delight of the locals. Donna also worked behind the scenes at Rfalconcam. She was one of the administrators of Rfalconcam’s Facebook page, posting photos several times a day and replying to comments from thousands of followers. She also tweeted on occasion as Rfalconcam on Twitter. And her “behind the scenes” contribution did not stop there. For many years, Donna took part in Banding Day as a moderator who posted banding information and answered questions in real time on the Forum and Facebook. Sadly, this year she was not able to participate due to passing of her beloved husband Ed just a few days earlier. And if that weren’t enough uncredited work, Donna also doubled as a part-time camera operator of Camera 1 to help us keep an eye on the falcons throughout the year. For her outstanding service to the Rfalconcam community, Donna was given the honor of naming an eyas Charlotte in 2017. After Ed’s death, Donna became more focused on family and planned to move to Spokane to be closer to her young granddaughter. Despite the rigors of moving, she still remained active on Rfalconcam. then Donna was the voice of Rfalconcam (or at least a huge part of it). Now that voice is greatly diminished. Miss you, Donna. Fly free. This was written by Rfalconcam member Shaky. This heartfelt farewell is shared by all of us who knew her. Just a reminder to join us tonight at midnight as we ROC Rfalconcam! And, yes, we have a plan to win the $500 and $1,000 bonuses. You can read all about it at http://rfalconcam.com/forum/index.php?topic=16758. The link to donate should be https://www.roctheday.org/rfalconcam (no confirmation yet). And, yes, we have a plan to win the $500 and $1,000 bonuses. You can read all about it at http://rfalconcam.com/forum/index.php?topic=16147. The link to donate should be https://www.roctheday.org/event/rfalconcam (no confirmation yet). ROC the Day is only a a few hours away! As previously mentioned, Rochester Area Community Foundation will be checking every two hours to see what registered organization has the most ROCstar donors during that time period. The organization with the most unique donors during each two-hour period will get an extra $1000 bonus. We are going to try to get that bonus during the first two hours. So stay up for a few more hours or set your alarm clock for midnight and then make a donation. It doesn’t have to be a big one. In fact, a small one might be better. You may want to make another donation later tomorrow if we have to make a second attempt at the $1000 bonus, which is tentatively planned for the two-hour period between 10 am and noon. Stay tuned throughout the day tomorrow. You can get the latest news on our ROC the Day plans at our Forum or on our Facebook page. You can also follow us on Twitter. By the way, the link to donate is http://www.roctheday.org/rfalconcam. ROC the Day – A Week from Today! ROC the Day is only a week away! Did you know that every hour one lucky ROCstar (that’s you!) will be randomly chosen to give an extra $500 bonus to the charity of their choice? There are 24 chances to win! Don’t miss it. 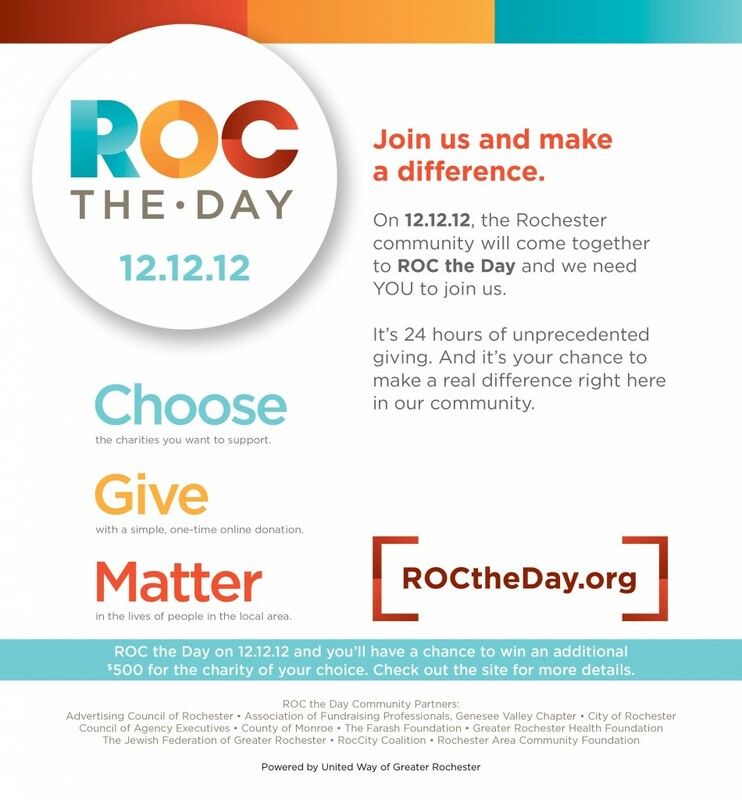 Sign up for a reminder at http://www.roctheday.org/ and get the latest news on ROC the Day activities at our Forum. Let’s ROC the Day together!